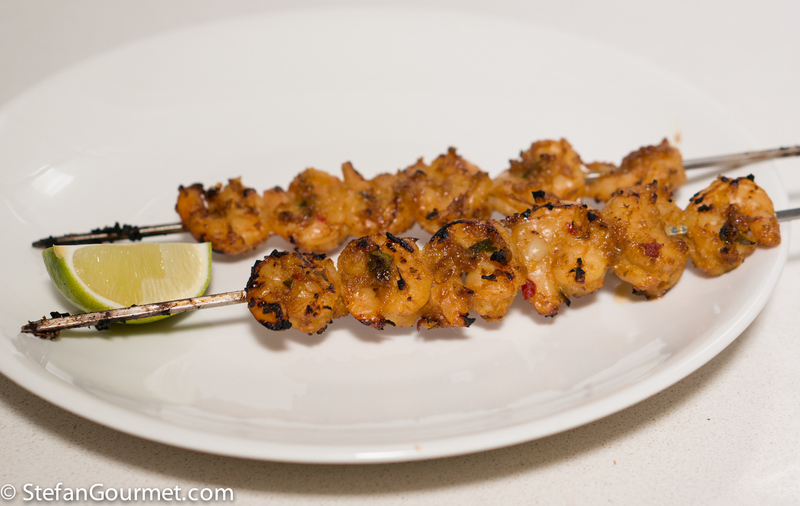 Saté is Indonesian for a grilled skewer of meat or seafood. Popular versions are chicken and goat. 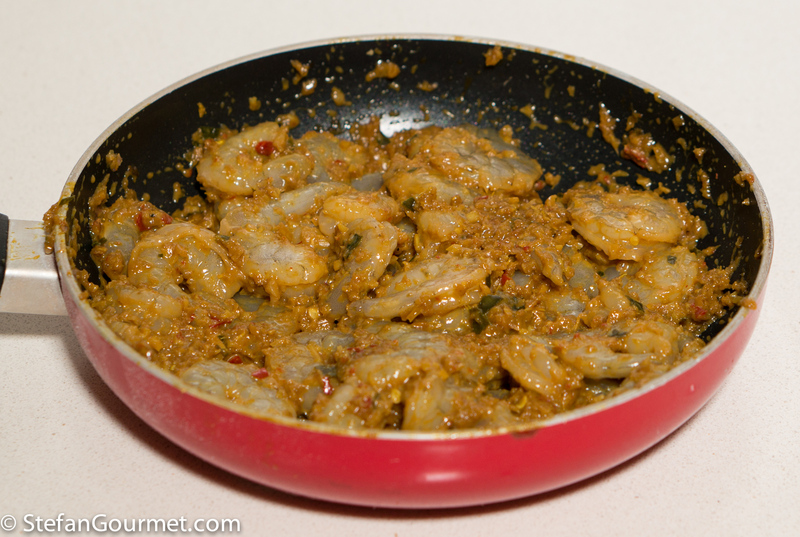 Four years ago, Putneyfarm posted a recipe for a Singapore/American version of shrimp satay (saté udang) that I put on my list of recipes to cook for the blog. 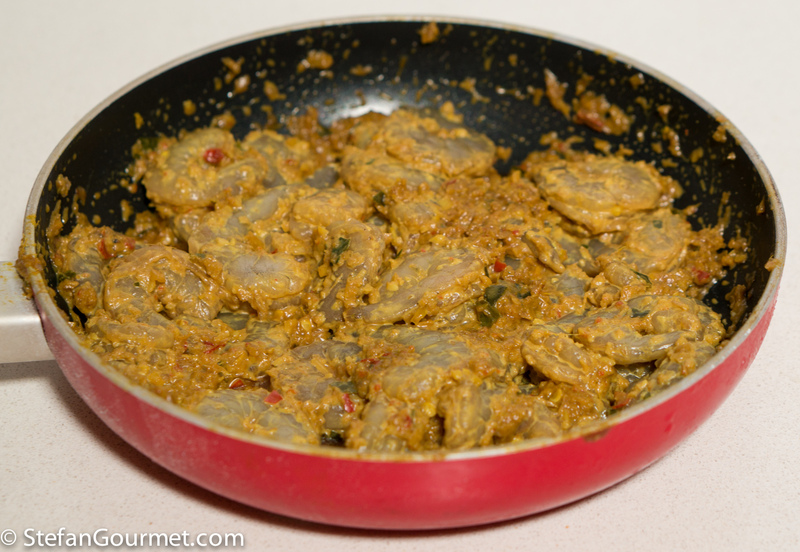 I finally got around to preparing my own version, which I’ve tried to make more Indonesian. 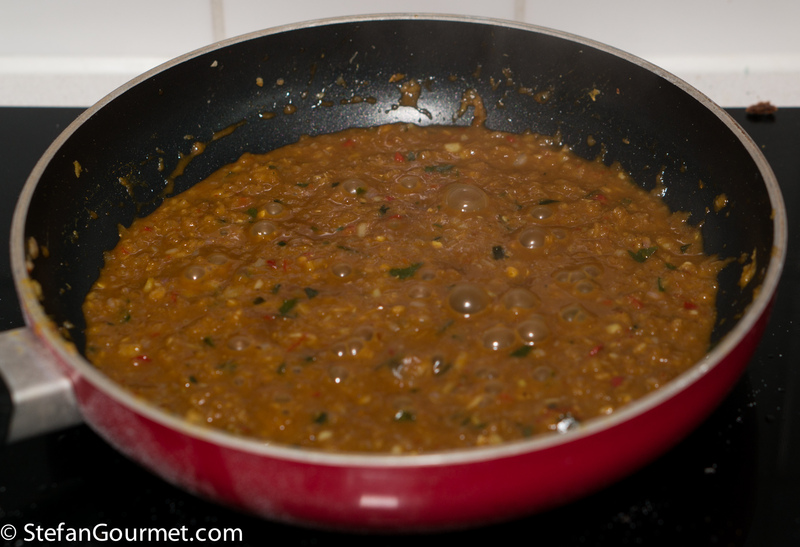 As with many dishes from the region, the curry paste (called bumbu in Indonesia) is the most important part. 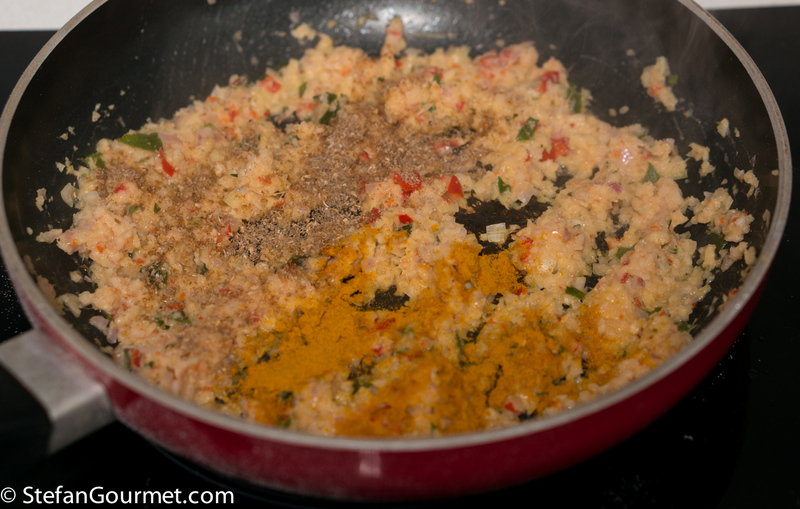 Once you’ve made that, you marinate the shrimp in it and then grill them over a hot charcoal fire. 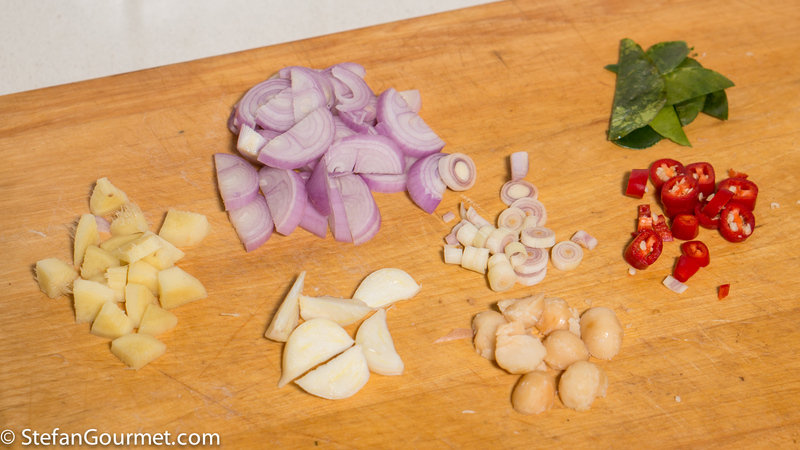 Prepare 1 lemongrass, sliced (part with purple inside only), 2 cloves garlic, chopped, 4 lime leaves, 4 Tbsp chopped shallots, 1 Tbsp chopped ginger, 1 red chilli pepper, sliced, and 1 Tbsp macadamia nuts. 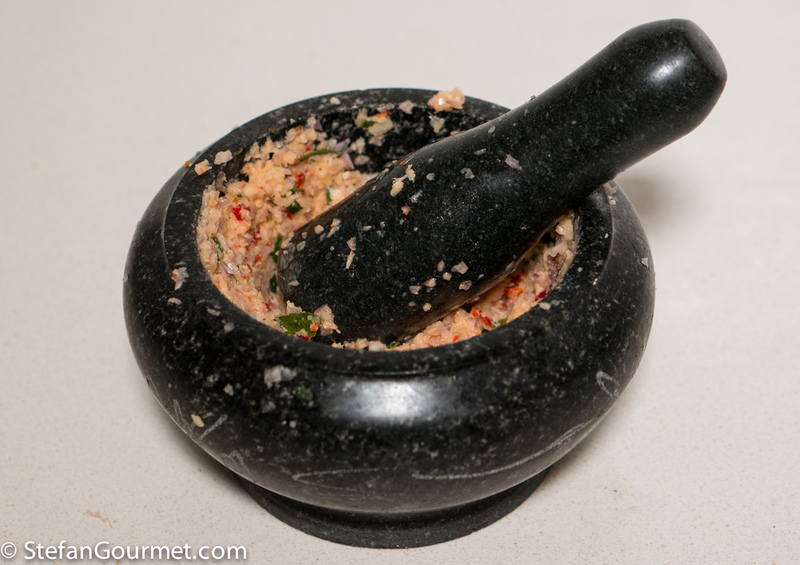 …before turning over to the mortar and pestle. 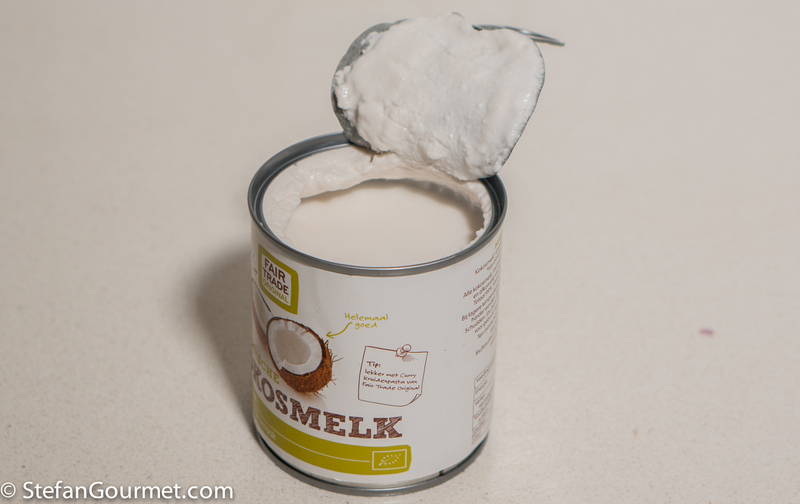 You don’t have to buy coconut cream separately, as it floats on top of a can of coconut milk. 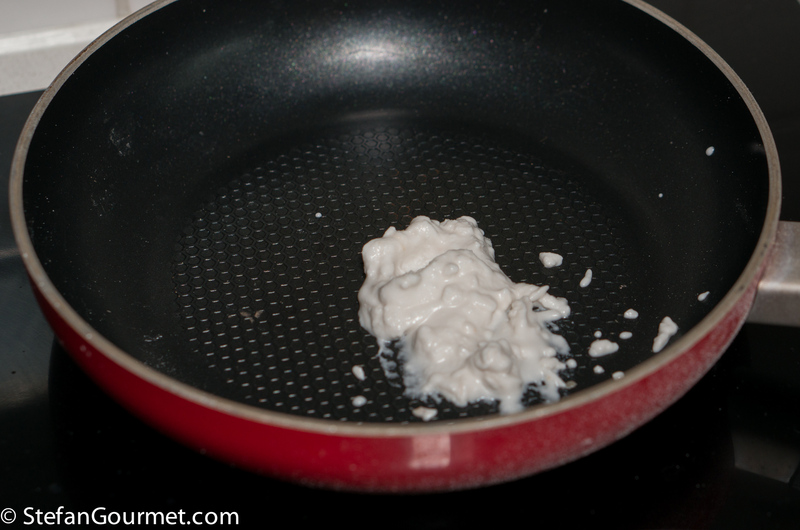 …until the cream starts to ‘break’. 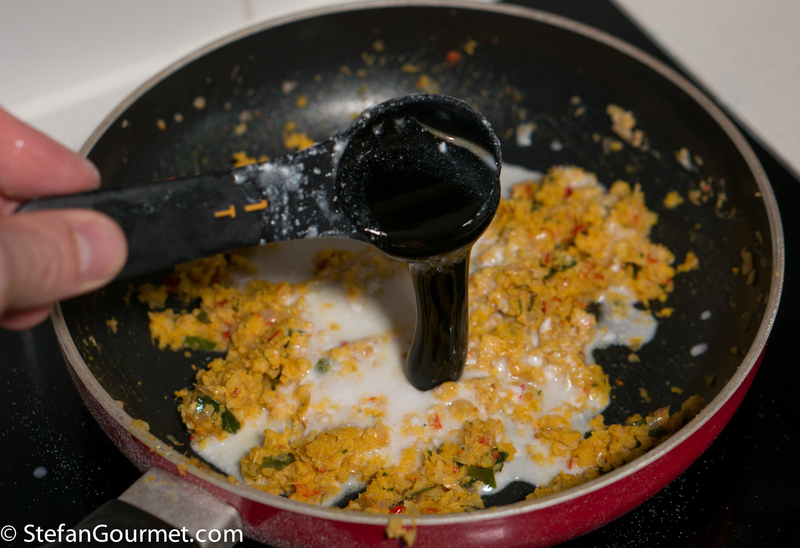 …and continue to stir over medium heat until it looks dry. 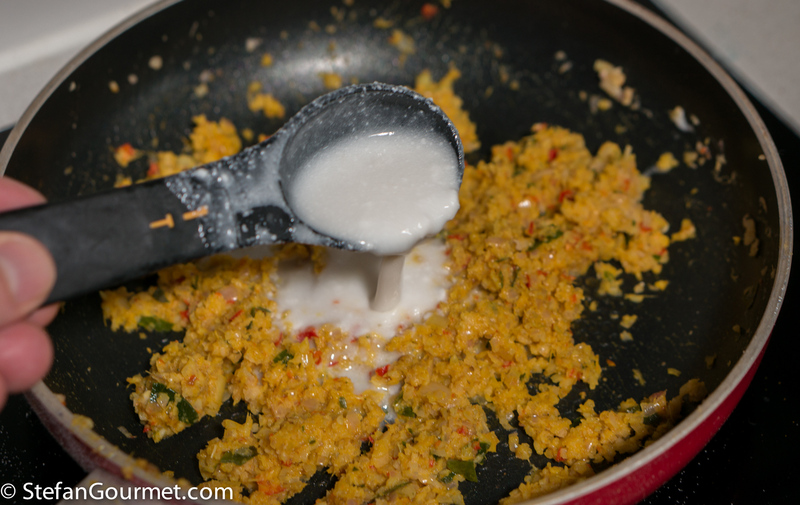 …and tablespoon of Indonesian palm sugar. 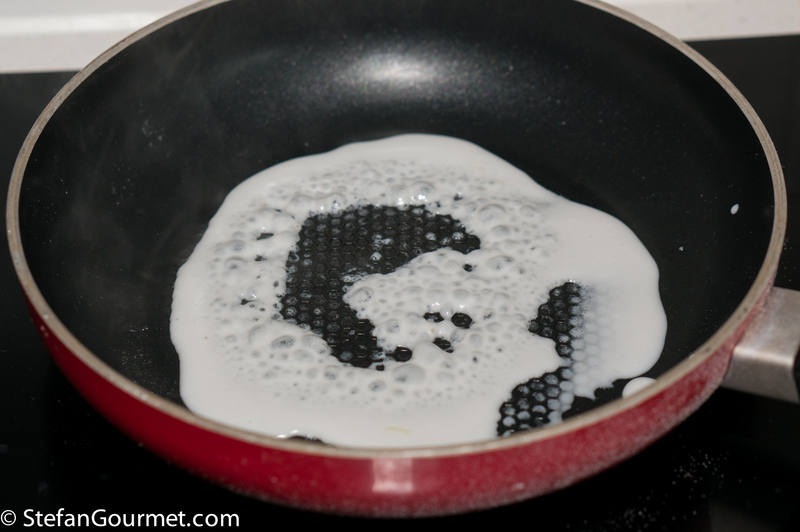 Stir over medium heat for a minute, then turn off the heat and allow to cool. 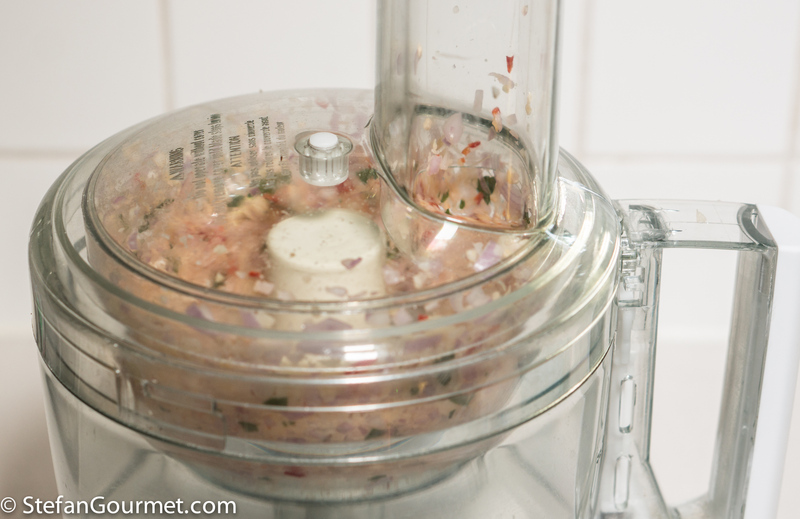 Wash and dry 300 grams of shrimp. 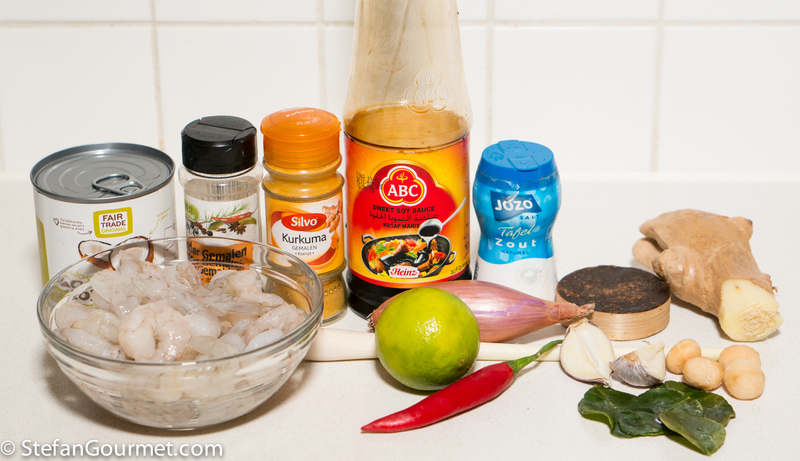 Once the bumbu is cold, mix with the shrimp. 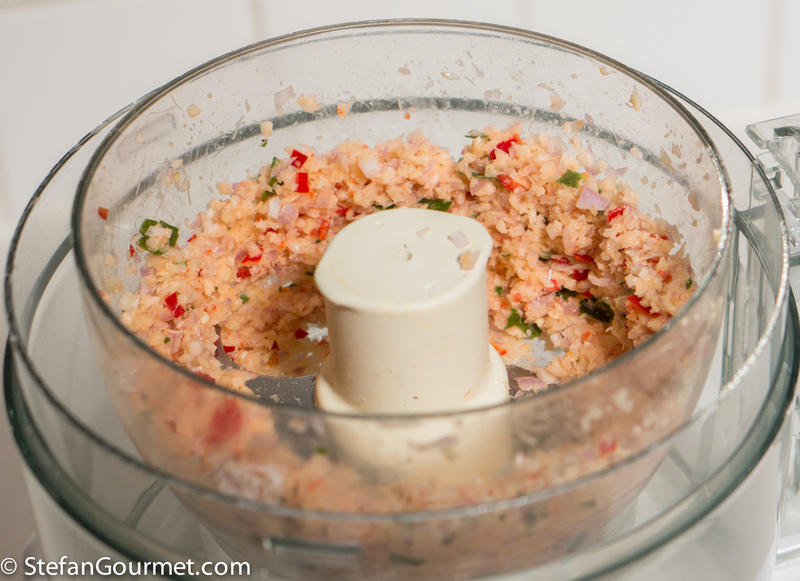 Then cover with plastic wrap and allow to marinate in the refrigerator for at least 1 hour. After marinating, thread the shrimp onto skewers. I like to use steel ones, as they won’t burn and can be used again. 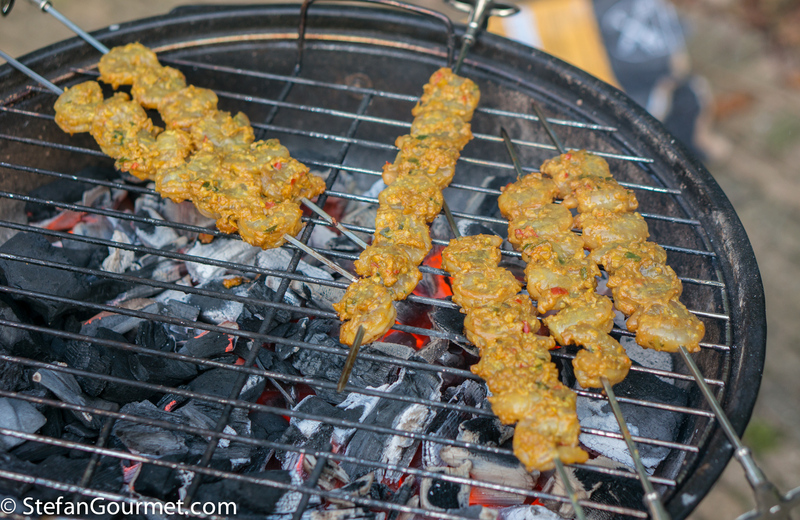 Grill the shrimp over a hot charcoal fire until just cooked through and slightly charred. 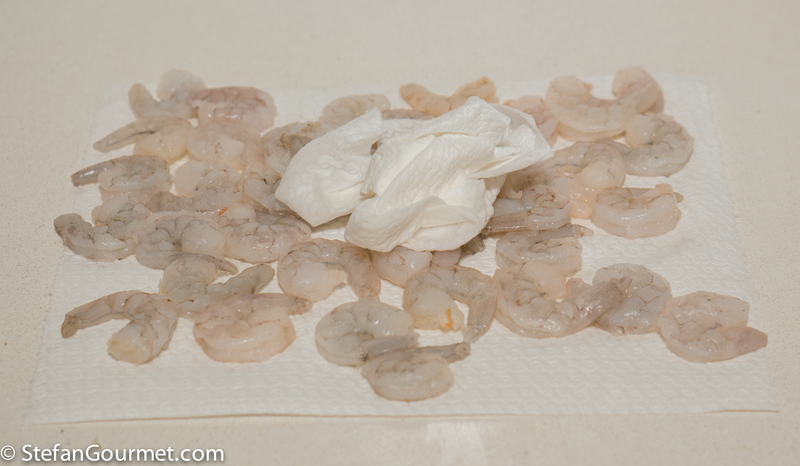 Do not overcook the shrimp as they will become dry and tough if you do. This calls for an aromatic wine but not too heavy. We enjoyed this with a dry muscat from Navarra in Spain. 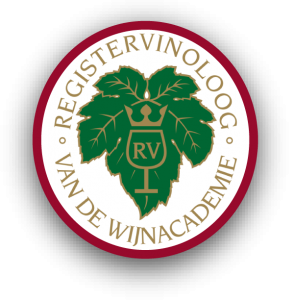 A lighter style gewurztraminer would also work very well. Shrimp and mushrooms are a classic combination in stir fry dishes. In this Chinese-style dish, I’ve added another layer of flavor by braising dried shii take mushrooms in oyster sauce first. It is a bit more work, but worth it. 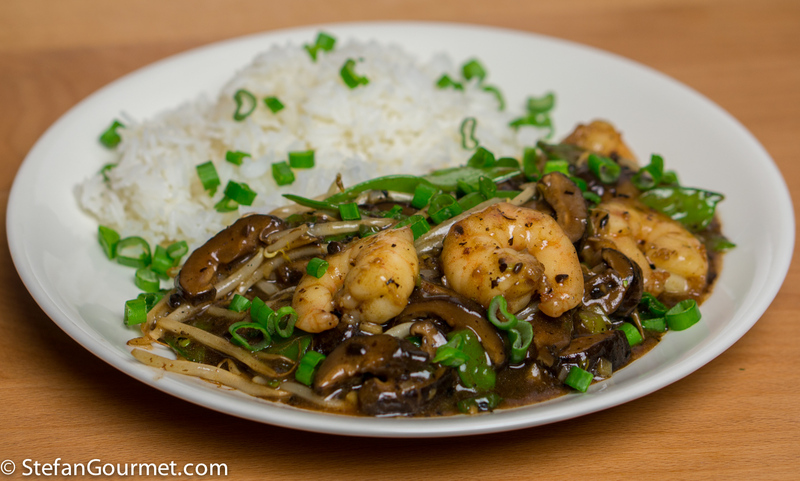 Tender juicy shrimp with slightly chewy flavorful mushrooms and crunchy vegetables combined with a delicious sauce with fermented black beans, garlic, ginger, chilli, and green onions, this is very tasty indeed. 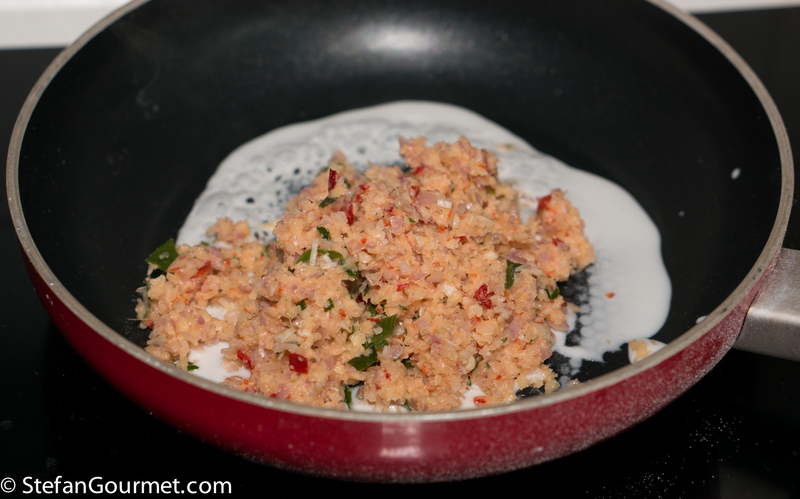 Prepared these, or at least similar to these laat week, a great way to prepare shrimp! 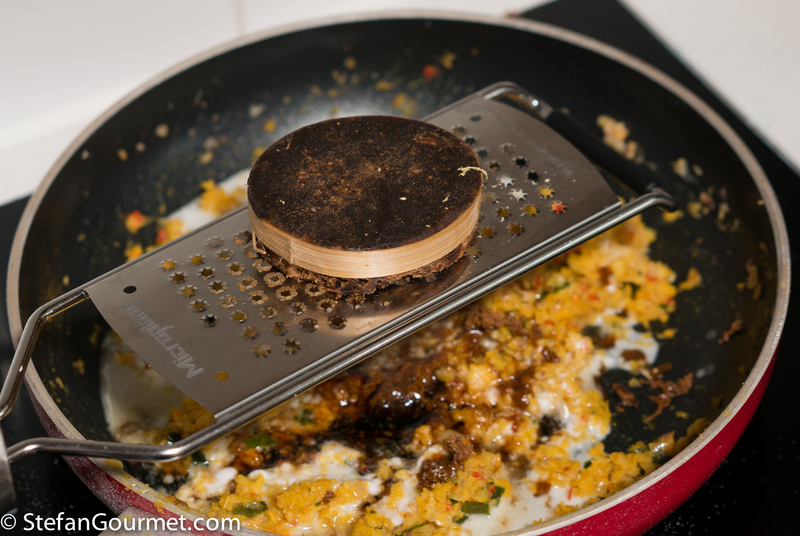 Now I am really hungry…. Wow that looks good. 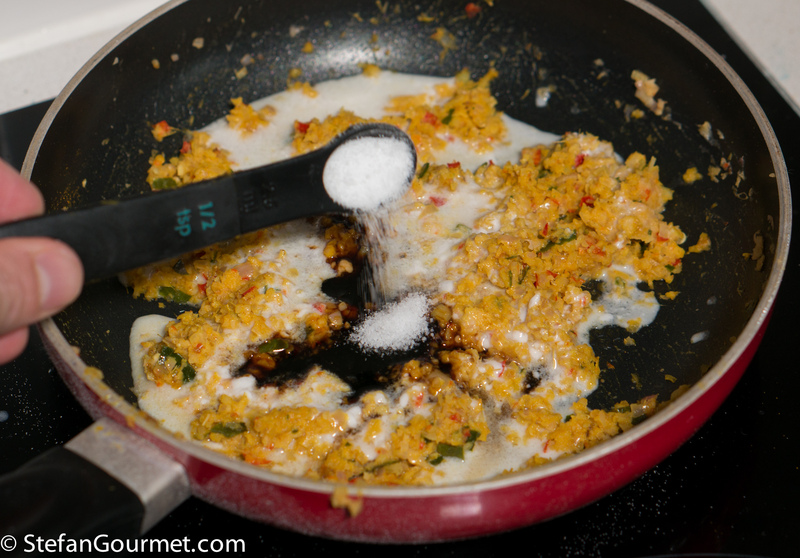 An interesting cooking process, with no frying or sauteeing. Wish I could taste the shrimp! *huge smile* Thank you for coming into ‘my world’ again! 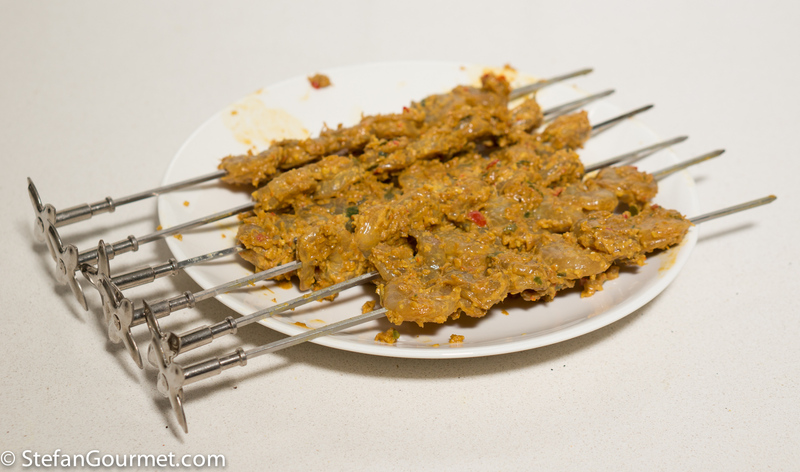 Down Under beef satays are probably the most common. Love your version – local differences: our trassi is usually in paste or almost liquid form; grow my own lemongrass and somehow ‘purple’ is not a colour we see in ours and I prefer bamboo skewers: they cost nothing and, as long as one puts them in a water-bath for half-an-hour, they will not burn. May I suggest to anyone reading that ‘kecap manis’ is probably the most fun bottle you can have in your pantry . 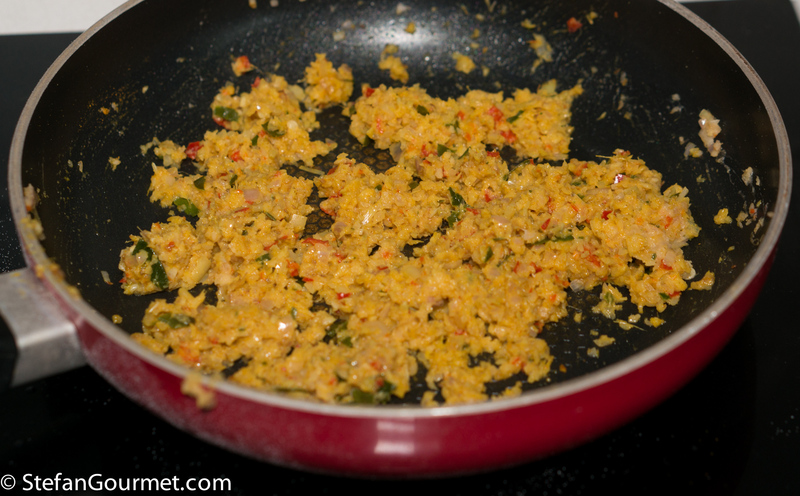 . . use it in so much fusion cooking to good effect . . . thank you!